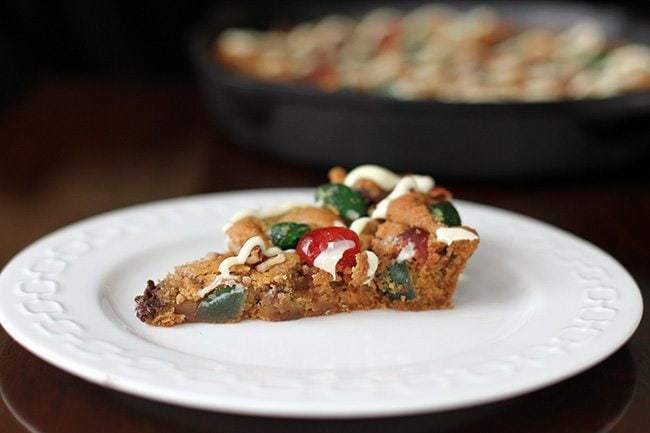 Four ingredients ink this Christmas Fruitcake Chocolate Chip Skillet Cookie, folks. Four. Let’s just take that in for a second. Christmas is amazing, wonderful, holly-jolly and my favorite time of year. It’s also insane, chaotic, stressful and can be a royal pain in the patootie. Yes, even me, Mrs My-Christmas-Tree-Would-Be-Up-Year-Round can admit that Christmas can send the best of us into tailspins. Thus the reason why I encourage you to cheat. If there’s one thing you can be certain of on this website, I’m not Suzy From Scratch All The Time. Ain’t gonna happen. I’m just as busy as the rest of you and I do cheat baking. I fully encourage you to cheat and make this. It’s so simple. All you need is a cast iron skillet – I used 8 inches but for a thinner cookie you can use a larger one- cookie dough. You press two-thirds of the cookie dough into the skillet evenly then mix together the remaining third with pecans and the chopped cherries. Then you sprinkle the cherried dough on top, pressing down slightly to make it even. This way, picky eaters can pick off the cherries, like my daughter (insert eye roll here). Why would you pick off the best part!?!?! Once it’s baked, you drizzle melted white chocolate over the top. I’m such a cheater and I can live with that. 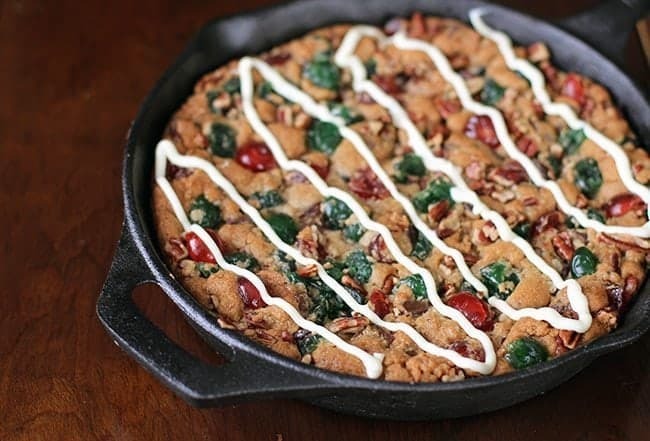 I have a major thing for this skillet cookie. 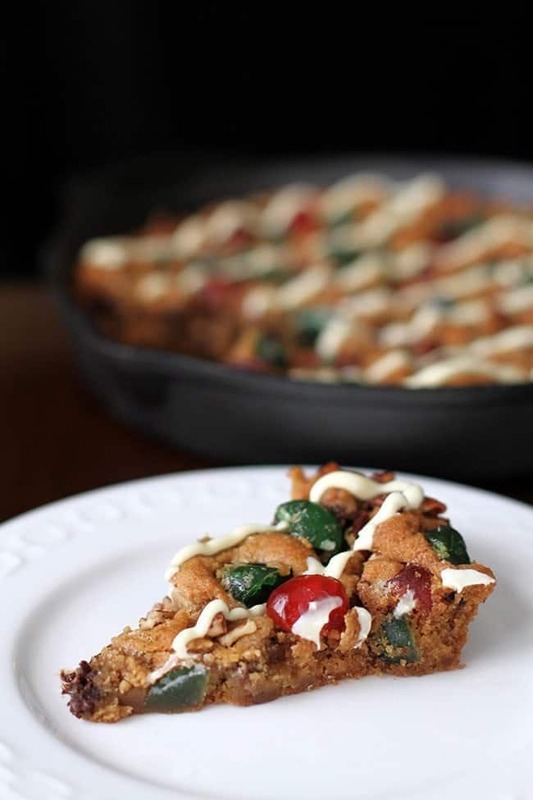 I love the candied cherries that are used in Christmas baking and to put them on top of a giant chocolate chip skillet cookie? Now, remember my trick of making this a hostess gift the next time you are invited to a soiree. 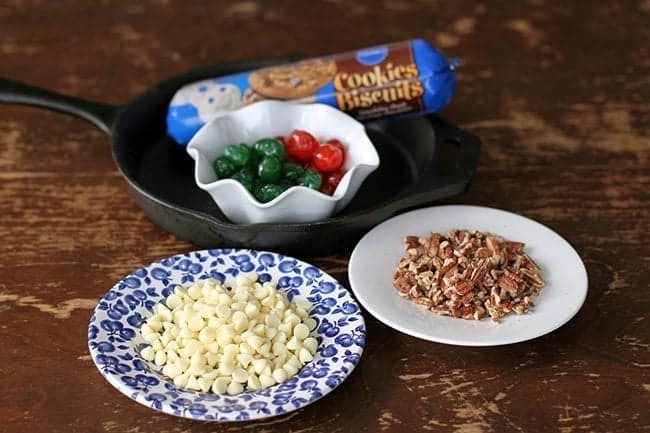 Simply bake the dessert in the skillet and attach a card that has not only the recipe for the dessert written in it, but also how to care for their new cast iron skillet. I would definitely go with a smaller 8 inch skillet for a hostess gift and make sure you attach the recipe, there’s more chance they will actually use it. Happy baking everyone! There are so many easy recipes coming your way the next few weeks, I am so busy that complex was NOT on the agenda this year! Do you have any favorite cheater recipes that you make every year? Thanks for stopping in everyone, I really hope you make this cookie, let me know if you do! PIN THIS RECIPE to your CHRISTMAS COOKIE RECIPES Boards and Remember to FOLLOW ME ON PINTEREST! 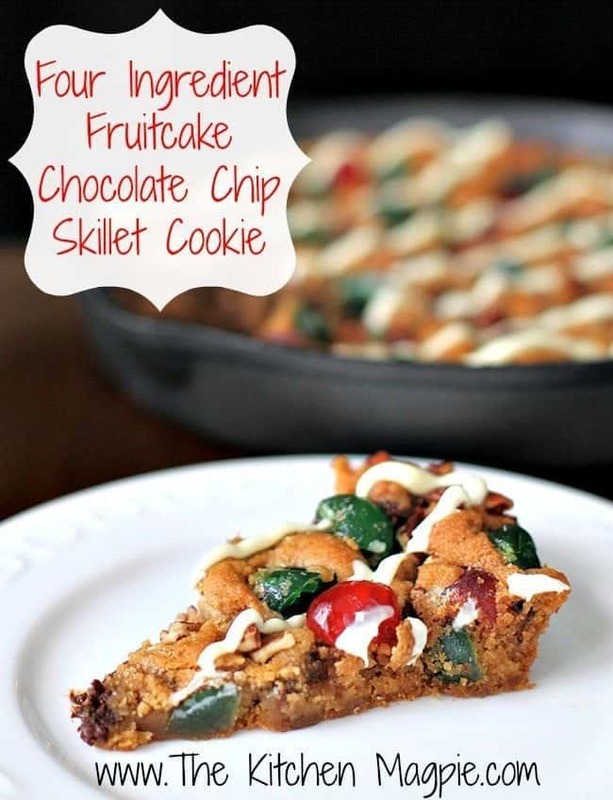 Easy and delicious 4 ingredient Christmas Fruitcake Chocolate Chip Skillet cookie. Spread 2/3 of cookie dough into the skillet. Press evenly. In small bowl, break up remaining 1/3 dough. Stir in candied fruit and pecans. 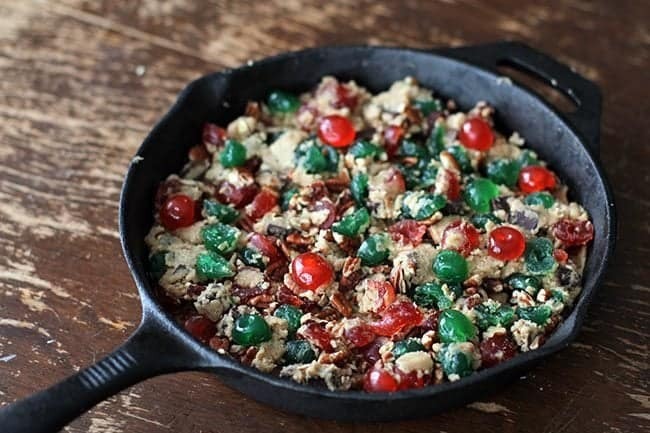 Sprinkle candied mixture evenly over the dough in the skillet; press in lightly. Bake 25 to 30 minutes or until deep golden brown. Cool completely on wire rack, about 1 hour. Combine white chocolate chips with oil in small microwave dish. (If you have good white chocolate that melts nicely, skip the oil). Microwave on High power 30 to 60 seconds, stirring every 15 seconds. Stir until smooth. Then drizzle back and forth over the top. Cut into pie shape wedges to serve. How festive! I love the colours! cuzilikechoclat I know, the colors make me so happy! !